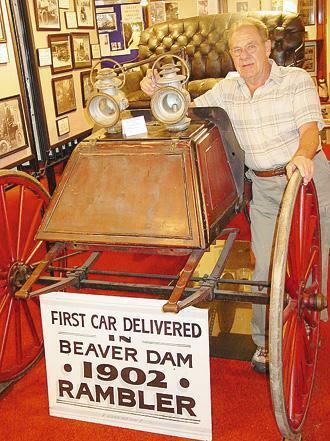 When Bill Reifsnider walked up to the 1902 Rambler in the Dodge County Historical Society museum, he paused for a moment, walked to the other side of the car and then remarked to Bob Frankenstein, "I think I've got the headlights for this." The star of the museum's collection was originally equipped with kerosene-powered lamps. However, for as long as anyone can recall, the model has been missing its headlights. 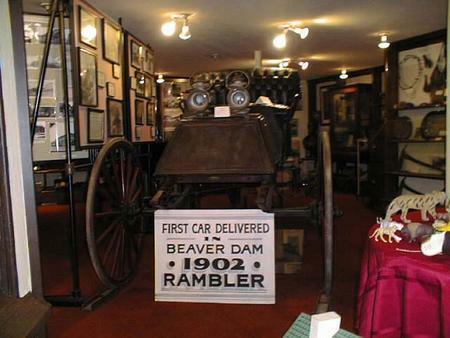 Yet by that chance visit and Reifsnider's subsequent donation, the first automobile in Beaver Dam now has lights. "You should have seen his jaw drop," said Reifsnider in describing Frankenstein's reaction to his comment. Even then, Frankenstein, who was giving Reifsnider a tour of the museum, doubted that the long-missing lights would match those in early photos of the car. Bill Whiteaker, who was working at the museum that day, had similar doubts. After all, what are the chances that a 40-, 50- or 60-year mystery would be solved? It's unclear if the lights were on the car when the car was donated to the museum decades ago by the widow of Sam W. Rowell, the car's first owner, and her son, George Rowell. In any case, it was housed for years in the upstairs of the old Concert Hall on Front Street, then at the old railroad depot and now at the former William's Free Library. All three sites have been home to the museum. There are several theories about how the headlights were removed from the car. The most likely states that they were taken off with the goal of having them restored. They were never returned. Reifsnider's guess is that they ended up in the hands of Police Chief George Groling, who once rented a home to Reifsnider's brother-in-law. Reifsnider recalls helping his brother-in-law move from the home in the 1960s. At that time, he was offered the lamps. The antiques traveled with Reifsnider, moving at least four times. From Atwater to Burnett and finally to Beaver Dam, they always hung in the basement. And that's were they were hanging when Reifsnider made a visit to the museum in August to learn about an old Monarch range that he owns. Whiteaker had spent two hours gathering information on the range when Reifsnider joined him and Frankenstein, a volunteer, on a tour of the museum. When Reifsnider announced that he would bring in the headlights, the two historical society representatives were elated. "It seems incredible to me that after 100 years, the lamps have made it back to the automobile they belong on," Frankenstein said. "This is their home," said Reifsnider. "It's the place for the headlights. I'm happy that I kept them." 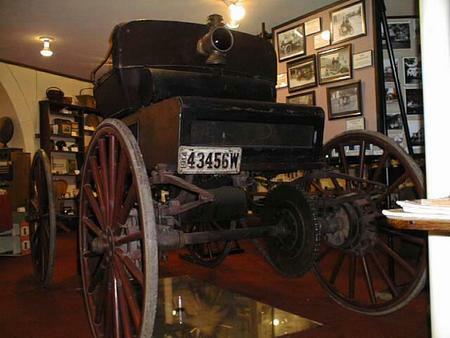 Al Krueger, a member of the historical society, has contacted the Hartford Auto Museum, which has a similar model, to get dimensions of a bracket for the light. After completion, the lights will be mounted on the car. Krueger said the completed car will have a value in excess of $30,000.